Mademoiselle Yulia (マドモアゼル・ユリア) attended the premiere of 'The End', Japanese virtual pop idol, Hatsune Miku's virtual vocaloid opera held on May 22, 2013 in Tokyo, Japan. Following her beautiful Stella McCartney look, her Louis Vuitton runway look from Spring/Summer 2013 collection was just as impeccable. It was accessorized with a waist belt which I preferred over the runway styling. 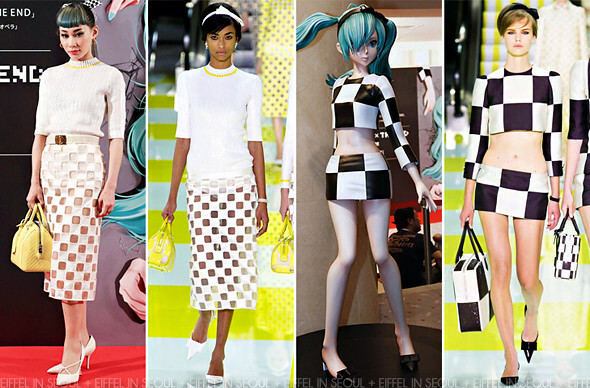 Virtual pop idol, Hatsune Miku (初音ミク) was dressed by Louis Vuitton in a two-piece black and white checkered look from Spring/Summer 2013 collection.